If you wish to have straighter teeth, in a fraction of the traditional amount of time, you’re in luck. A revolutionary treatment has now consolidated the treatment time of traditional braces from 2 years to up to 8 months! This is an alternative to braces that reduces the time-frame. We are lucky enough to live in a society where modern dentistry is constantly updating and adding new and improved treatment options for various procedures. Surgically Facilitated Orthodontic Treatment (SFOT) or also called Wilckodontics is an advanced orthodontic procedure that utilizes the underlying issues of the bone and tooth arches that cause the misalignment. In the past, dental professionals would simply adjust these issues by forcing the orthopedic solutions on the teeth, pressuring them to adjust accordingly. Orthopedic solutions have only adjusted minimally since their introduction into the industry. Brackets have been made smaller and clearer, stiff wires have been given some bend, and Invisalign has been recently introduced as well. However, in recent studies, dental professionals have found the positive results in adjusting the cortical plates that are above the teeth crowns. When teeth grow in, the cortical plates establish their foundations in the mouth. This is the bone tissue that lives directly above (or below) the teeth, underneath the gum tissue. 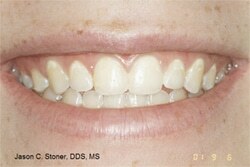 These are sometimes referred to as orthodontic walls. When these walls are adjusted, teeth can become straighter, much faster. The realignment of these teeth will also stay in place for much longer as the plates are not working against the teeth (as in traditional braces). In the past, dental professionals have ignored the “orthodontic walls” and have led to unstable results. Periodontally Accelerated Osteogenic Orthodontics (Braces) aren’t considered a fashionable statement. This periodontic treatment allows the time-frame that a patient must wear braces to be accelerated up to 50% faster. Only specially trained periodontists are able to perform this relatively new technique as it is an advanced orthopedic treatment that if not administered correctly, could be damaging. At Stoner Periodontic Specialists, we are thrilled to provide this treatment option to those who are looking for a quicker way to align their teeth. Periodontally accelerated osteogenic orthodontics – sometimes referred to as “Wilckodontics” – is a technique that involves inducing the bones that surround the teeth into a process called rapid acceleratory phenomenon (RAP). This phase allows the teeth to move faster, making realignment easier and quicker. Because this treatment offers patients a newly aligned smile 2-3x quicker than traditional braces, children can opt for this option for the summer months. By the time the next school year rolls around they are ready to show off a brand-new smile by the Fall. This procedure is especially popular among adults as well. It is becoming increasingly embarrassing to have to wear braces at an older age. Therefore, any procedure that could speed up this process is a popular option for these adults. Since this is a slightly more invasive form of orthodontic treatment, our patients will be put under a local anesthetic to ensure no pain or pressure is felt during the procedure. Many patients don’t feel anything with the procedure is underway, however, may experience some soreness after the treatment. An over-the-counter pain reliever can alleviate these types of pains quickly and easily. Once the patient is completely numb, the periodontist will start by gently pulling back the gum tissue that covers the roots of the teeth. The periodontist will begin to graft new bone under the gums to remodel the tooth’s movement. Since bone tissue is extremely hard, the time it takes to shift each tooth over is directly in response to just how dense the tooth is. Once this procedure is finished, the teeth will still be added the traditional brackets and wire to hold the teeth in place for some healing. The bone will now respond to the orthodontic forces created on the dynamics of the bone, aside from the force applied by the teeth. This allows the patient to come out with faster-driven results as well as having straighter teeth for longer. It is extremely common for patient’s teeth to shift after their traditional orthodontic procedure, this is mainly due to the singular force being applied to the teeth for alignment. This procedure is recommended for patients of all ages, so long as they boast healthy teeth and gums. If you are interested in learning more about this procedure, don’t hesitate to call Stoner Periodontic Specialists for answers to your questions. We have trained professionals waiting for your call to address any questions or concerns that you have on Wilckodontics. This is a revolutionary procedure that provides a new and improved way of treating misaligned teeth. While the adjustment period may seem intimidating, many patients report of feeling no pain thanks to the local anesthetic. The quick results that are achieved from this treatment provide patients a better reason for getting braces. Don’t let your teeth stay misaligned for another day and call our office about Wilckodontics. In just a few short months, you could have the straight smile you’ve been dreaming of.